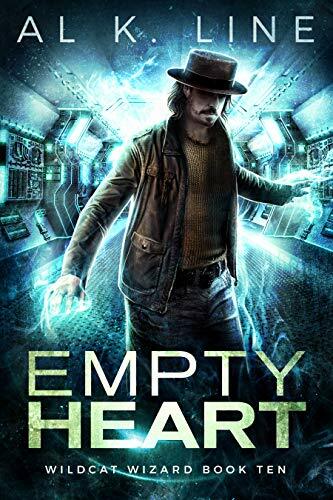 Empty Heart is the tenth installment in the Wildcat Wizard series by Author Al K. Line. Continuing some time after the close of Death Calls, newly mortal Arthur has just returned from two weeks of bliss on honeymoon with Penelope. Upon their return, it becomes painfully apparent that something is afoot. After being rudely accosted by a Customs agent, Arthur quickly realizes that everyone he encounters is telling the truth… and it’s not all good. Ivan wants Arthur to get to the bottom of the disturbance, but he’s a thief, not a goon and this really isn’t his wheelhouse. Only when Steve approaches Arthur to enlist his assistance locating a missing person does Arthur finally take notice. An incredibly powerful shifter has been kidnapped and if this “mega shifter” for lack of a better word falls into the wrong hands it would wreak havoc with all of humanity. To make matters worse, the kidnapped happens to be Steve’s very own daughter. With the job now becoming personal, The Hat, Steve, and Vickie are on a mission to find Sunshine before it’s too late. Now that the proverbial cat has run all out of lives it’s a much more rational and cautious Hat that we are dealing with in Empty Heart. But don’t let that throw you off, what he lacks in immortality Arthur more than makes up for in wit and ingenuity. For me, with the Hat now having to be concerned with his life, he sort of reminded me of Spark, but a lot less stylish and a ton grumpier! With everyone around him going totally bonkers as they are affected by the influence of Sunshine, Arthur also finds it increasingly difficult to keep things straight. Add in the fact that Cerberus has returned in a most unexpected way and are also in hot pursuit of this living anomaly it leaves the Hat with very few options for keeping Steve’s daughter from being locked up or put on display like a circus animal. While I am satisfied with the ending and dare I say it almost gave me the “warm fuzzies”, it does also leave a pretty huge elephant on the room. Where do Arthur and Vicky go from here? Next up is Sand Storm, and with the series starting to wind down and it will be interesting to see how the changes brought on in Empty Heart affect our Wildcat Wizard in the next installment.